Motion Capture has never been brighter! Since the release of the first outdoor Oqus, the engineers at Qualisys have mastered the art of motion capture in almost any given environment, from subzero temperatures, to wet and rainy conditions. The company is now making the next step , with the new Sun FIlter there is never too bright of a day to capture outdoors. It optimizes the cameras performance in instances of extreme sunlight. Qualisys Sports Performance and Salming North America is attending The Running Event December 1-4 2015, Austin Convention Center, Texas USA. 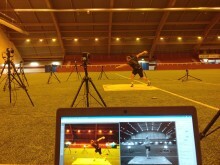 Take the opportunity to meet us and experience Salming RunLAB powered by Qualisys state of the art Motion Capture System.